Pen Company of America today announced it will launch its new line, "Original Foldzflat," during the National Stationery Show at Jacob Javitz Convention Center in New York City from May 15 - 18 at booth 1234. 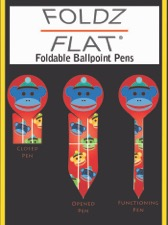 The “Original Foldzflat” product line includes the Foldzflat Pen and Foldzflat Bookmark, patented products unique in the world of writing instruments and manufactured in the USA. The Original Foldzflat Pen is a full-size, ergonomic ballpoint pen capable of folding as a flat, credit-card sized item able to conveniently fit in a pocket, wallet or purse. The product seamlessly snaps open from its flat state and becomes a full size pen. An advanced printing process allows full color graphics to be imprinted onto the pen’s surface. The Foldzflat Bookmark allows the pen to be folded up into a flat object that converts into a bookmark. In addition to its stock retail designs, Pen Company of America has the ability to customize the Foldzflat product line for souvenir items, highlighting a tourist attraction, city or event. The National Stationery Show has been showcasing unique and staple items for the stationery and office product industry for 70 years. With global attendance of over 10,000 buyers and industry professionals, the show at the Jacob Javitz Center is the premier industry event to showcase new and creative products. Pen Company of America (PCA), a subsidiary of Rotuba Extruders, molds, assembles and decorates all its products in its Garwood, NJ facility. PCA has been manufacturing writing instruments in the United States since 1924. With over 100 million pen and marker components produced annually, PCA products are sold into multiple industries including government, advertising specialties, medical supply distributors, retail outlets and more.